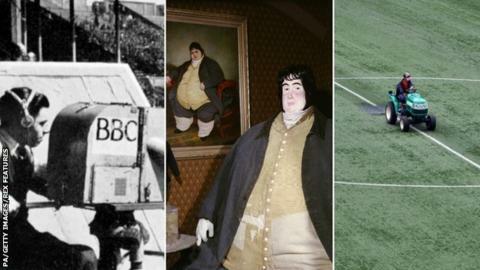 A non-league club that took its nickname from a jolly fat man features among the pick of this season's FA Cup first-round ties. Stamford, also known as the Daniels for a big reason, face League Two side Hartlepool after reaching the first round for the first time. There are 40 ties in all, starting with matches at Millwall and Eastleigh on Friday, and eight non-league clubs are guaranteed a spot in round two. The supporters' trust urging fans to refund their opponents. The non-league side with cameras on their side. Trees that may put their rivals off. United. City. Town. Nicknames of football clubs can often be quite dull. But Northern Premier League Division One South side Stamford AFC, conquerors of National League club Wrexham in the previous round, are known colloquially as 'The Daniels' after Daniel Lambert - once the heaviest man in history. Born in Leicester, Lambert was a highly-regarded jailer in the city in the late 18th century and was of normal size until his early twenties, when his weight increased at a rapid rate. By the time of his death aged 39 in Stamford in 1809, he weighed 52st 11lbs, with a waist size of 9ft 4ins (284 cm) and a calf size of 3ft 1in (94 cm). It was not through gluttony that Lambert gained weight, but a glandular problem, leaving him fondly thought of in the places of his birth and death. "He's sort of like your old uncle and seems to be quite a cheery character," said Philip French, curator at Leicester History. "It was at the time of the wars against Napoleon and there are cartoons where Lambert is taking on thin, bony Napoleon and he's the proper true, English fine stock on a horseback with his military uniform on, attacking Napoleon." Lambert struggled to hold down a job because of his weight, so to earn money he travelled around and wherever he went people would pay a shilling for an audience with him. "He sat and had a conversation with the audience, but if you asked him personal questions he didn't like it," said French. "Effectively I think people just went to gawp." So why would Stamford's football team name themselves after him? "It was the perfect name for the football club. He was a great character so it's a great nickname," said the Lincolnshire club's chairman Bob Feetham. Ninth-tier side Westfields, formed in 1966 following England's World Cup triumph, are the lowest-ranked side left in the competition. They started their cup run in the first week of August and have won through six ties to reach round one. To put that into context, if a Premier League side won as many matches, they would have picked up the FA Cup trophy by now. While hosting an FA Cup first-round tie is a dream come true for a non-league side like Taunton Town, it simply does not happen without the extra work of volunteers and a few part-timers - especially when one of them is the groundsman who also runs the club. There has been unprecedented demand behind the scenes as the Somerset club, who have reached round one for the first time for 35 years, prepare to face Barrow. "We have no full-time staff. I'm paid for 27 hours and do about 100," Taunton chairman and head groundsman Kevin Sturmey told BBC Points West. "From an administration point of view, we have gone from being a Sunday League team to Manchester United in two weeks. "It's frustrating sometimes - the world we live in is very much instant. But it's fantastic. It's great that people are rallying around and helping us out, doing odd jobs. "It's a dream to get to the first round. Every season, we've looked on at others enviously." The latest planned protest by Blackpool fans against the club's owners is set to leave non-league opponents Kidderminster Harriers short-changed when it comes to their share of gate receipts. The Blackpool Supporters' Trust have said that "adopting the ethical boycott" could see one of the lowest attendances in decades at Bloomfield Road. While their grievances are with the owners, the fans' group have urged those supporters who are staying away to make a charitable donation of between £6 and £13 to Kidderminster. As Harriers are entitled to 45% of gate receipts, the £6 is what they would have taken from each matchday ticket. The National League North club's chairman Colin Gordon says, while the gesture is very generous, the club could still miss out on thousands of pounds. "So far, over 200 people have donated the equivalent of our share of the ticket, £6," he told BBC Hereford & Worcester. "So it's a long way short - if we just got their average gate we would maybe make £25,000. "Our fans are travelling in huge numbers, which is great for us - we just hope we can perform on the pitch and (go through), which could generate more income." Venue: Silverlake Stadium Date: Friday, 4 November, 19:55 GMT. Last season's FA Cup will live long in the memory for National League Eastleigh, forcing then Championship club Bolton to a third-round replay before losing 3-2 at the Macron Stadium. Eastleigh will be looking to emulate that giant-killing run against League One Swindon Town. They beat opposition from the same division at the same stage last season with a 1-0 win at Crewe. Former Tranmere and Rotherham boss Ronnie Moore is in charge of the non-leaguers and knows a thing or two about being involved in televised ties. "It's a fantastic draw, the pressure's all on them," he told BBC Radio Solent. "I had it last year with Hartlepool when we went to Salford City in the second round. The TV cameras were there as they thought we were going to get beaten. "It's probably a big reason why they've put the Swindon game on TV. "We're going to enjoy it. There'll be 2.5-3m people watching it, so it's a great stage for us to put Eastleigh on the map again." There are 10 former FA Cup winners in action in the first round. One of those is Wimbledon and that is where it gets complicated, as 1988 FA Cup winners Wimbledon moved from south London to Milton Keynes in 2003, with MK Dons officially established a year later. AFC Wimbledon, formed in 2002, claim ownership of Wimbledon's history. Merstham goalkeeper Phil Wilson will be familiar to League One opponents Oxford United when they meet the Surrey village side on Saturday. He came through the U's youth ranks, saved a penalty on his senior debut for the club, then conceded three goals in 10 minutes in a 6-2 defeat by Bristol Rovers in 2001 and only made one further first-team appearance. "It is a dream to get Oxford," the 33-year-old told BBC Surrey. "It's the club I grew up supporting and it was special playing for them. "It was disappointing not to get a full pro contract there but I played in the Football League. I am looking forward to it rather than trying to prove anything." Moatsiders manager Hayden Bird hopes the non-league minnows, of the Isthmian League Premier Division, can take advantage if Oxford's professionals fail to adapt to conditions at their 2,000-capacity ground. "It'll be an environment they're not used to," Bird said. "Merstham is a really picturesque non-league football stadium. When they walk in and see there are more trees than stands, it will be something for them to get their heads around." Reporting by Phil Shepka, Ged Scott, Adam Williams, Tom Garry, Rob Stevens and Andrew Aloia.